This “fearsome beast” roamed the Jurassic landscape, dashing and darting between the legs of giants. 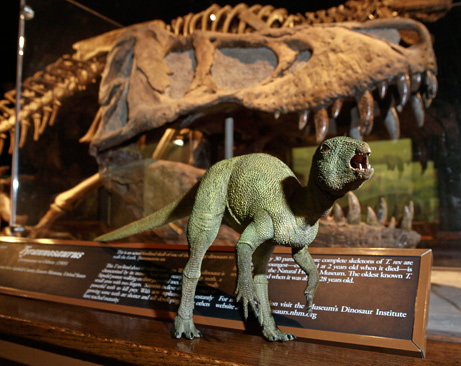 The Fruitadens haagarorum, or Fruita-Tooth, is the smallest dinosaur discovered. It weighs less than 2 pounds (or 1 kilo) and was roughly 28-inches long as an adult, which makes it about the size of a teacup Chihuahua and worlds smaller than the teacup pig. It goes without saying that scientists better be hard at work cloning these critters, because I don’t know anyone who wouldn’t trade their lizard or snake in for a Tinysaurus like this one. Wouldn’t it make an awesome pet? Considering that it eats a wide variety of foods and has omnivore-style teeth (including molars and canines, kind of like a cat or dog), I bet it could eat modern pet food no problem. Just toss in a boiled egg or some cat grass now and then and you’ve got your very own snuggly pet dinosaur!